Today's subject of CLAT 2017 topper interview is CLAT 2017 AIR 5 Himanshu Ashwani comes from the Bal Bhawan School of Bhopal. Made up of stuff that toppers are made of, he not only topped CLAT but also Grade XII boards. He likes reading, watching movies, dining out, and most of all playing badminton. His interest in international laws and policy-making made him pick law. He advices everyone to go for past year papers, good time management skills, and SWOT analysis. 1. Being one among the toppers your family and friends must be extremely proud. You got the 5th rank in CLAT 2017. Was it expected? How did you feel when you checked the results? Although I knew I would get a good rank and maybe under 100 but rank 5 was a surprise. My mother and I both felt proud. 2. What was your exam strategy? I dropped one year for CLAT. I also took coaching and referred some Successmantra law material which a friend lent to me. My rule was that I would devote 4 hours to my studies everyday besides coaching time. I joined coaching in June but only started getting serious around November. The good part was that Math and English were my strong points, and I was left with logical and legal reasoning along with GK. In my opinion current affairs is the make or break section. This section plays a vital role in the exam as that has been the pattern for last couple of years. Also, for me I needed to hone my logical reasoning skills. 3. Why did you choose law? My first thought was that I wanted to study in the best DU college. I scored a 93% in grade XII in the commerce stream and with that score I would have got only some decent college so I dropped an year for CLAT. Law happened because I was always very interested in being on top of what was happening at the international stage, and what determined international relations and I also had a keen interest in policy making. 4. What were you thoughts when you were preparing for the CLAT exam? Initially I was at a loss about what to study and had no fixed number of hours for which I would study. But gradually I picked up pace and started studying for 4 hours daily barring my coaching time. Mocks became helpful in strengthening my weaker areas. 5. What was your CLAT 2017 topper success strategy for each section? Which subjects did you find simple and which were tough? How did you improve upon your weaknesses? Solving all past year papers was my strategy and I solved papers from 2008 till 2016. I paid attention to each section of the past year papers. I would not solve the whole paper in one go but the same section of all years in one go. For example, I dedicated 3 days to the English sections of all years. I advice that keep your study material not too much so as to avoid getting confused. Maths was my strong point since childhood and Maths also plays a major role in Logic so these were the simpler sections. To make sure I improved my English consistently what I used to do is read as much material I could for instance novels, and class English newspapers along with online journals. I was also good at English since the start but I didn't relax and kept improving my grammar, speed and accuracy at comprehension passages, and tried to learn a lot of foreign words. Speed of solving the questions was another area where I invested a lot of time. The next section is Legal reasoning where I practiced about a 1000 questions and that was enough. When I solved these 1000 questions I started to notice that questions were getting repeated with little modifications. I devised tricks to solve these questions quicker and with accuracy. I paid attention to my coaching material a lot and relied on it heavily. I would say my weakest subject was GK. To improve upon this area I took weekly mocks from Successmantra. 6. What according to you is the right time to take mocks? My first mock was in August. In the starting itself my coaching mocks were once a fortnight and then from November my coaching center Successmantra made me take one mock a week. 7. How important are mocks in preparing for CLAT? I would say mocks are quite important. My mock number was 60. You get to know the exam pattern, and how well prepared you are, plus you get to learn with every mock and you get to know where you are making most mistakes. 8. Speed or accuracy? Which do you think is more important? When you are just starting out then speed is vital, and later you need to strike a balance. Analyze which is your strong point and build on the weakness. 9. Stress is bound to start building up during any exam preparation so how did you handle that? Share some CLAT 2018 topper tips. It is very important to find a stress buster. I would take one mock and then go eat good food outside to unwind. I would also play sports, and read novels, and am also a movie buff. 10. What would you say are your hobbies? You said you watch movies so which was your last flick before CLAT? I do many things but badminton is my favorite past time and my last movie before the exam was La La Land. 11. What was your thought process right before you were leaving for the exam? I was nervous because just a week prior I had attempted AILET and that did not go too well because I could not manage time well so I ate a chocolate before the exam as I have heard it has stress-busting qualities and once I entered the hall I was calm and cool as I didn't find the paper that tough. 12. Now CLAT is online so did you have a specific plan especially because the paper was online? I was quite ok with the online pattern since I had a good amount of practice thanks to the 60 online mocks which I took at Successmantra. After AILET I had a plan for how much time I would spend on every section. I would advice everyone to be good at time management to make sure they do well in the exam. 13. Some questions in the paper had errors. What is your take on that and did you write those questions? I feel that if you are well prepared then these are minor irritations. I wrote a few of those questions, but when I got an inkling that a particular question is wrong then I skipped that question. 14. What is the one thing you would like to share with aspirants of CLAT 2018? Past year papers are a must to be practiced is what I would say. Also, I would say SWOT analysis is necessary. Plus time management and knowing the amount of time to be spent on each question. Himanshu Ashwani is the role model for not just CLAT first timers but also to droppers and he dispels the myth that boards and CLAT cannot both be aced together. Infact he makes us think that CLAT toppers are those people who take their boards seriously as well. Isn't that the mark of a good student? It definitely is. We congratulate him again on his astounding success. 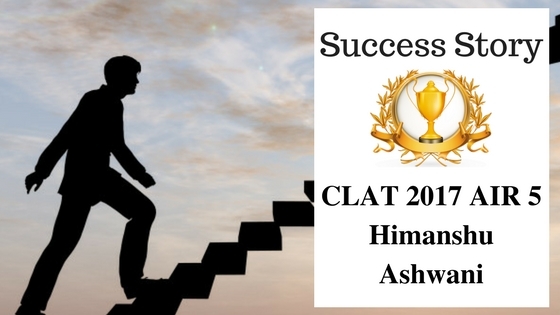 CLAT topper shared his success strategy with us. Read and follow the Toppers strategy to crack Clat 2018.